A recent report on the Global Mail, Tax Dodgers Sans Frontières, has brought to light that as many as 61 of the ASX100 listed companies have subsidiaries in “financial secrecy jurisdictions” such as Singapore, Hong Kong, the Cayman Islands and Jersey. The data was provided by the Uniting Church of Australia, in its Secrecy Jurisdictions, the ASX100 and Public Transparency report in May 2013.The UCA report revealed that 40 corporations listed in the ASX100 have 174 subsidiaries in Singapore, making it the most popular destination for subsidiary setup. The author of the report, Dr. Mark Zirnsak, said the report sought to promote greater transparency and is not suggesting that ASX100 firms are using their offshore subsidiaries for unethical purposes. He affirmed that there were many legitimate reasons for ASX100 corporations to opt for Singapore subsidiary formation. Analysis by Rikvin shows that location is a salient factor, given Singapore’s proximity to Australia and capabilities to bridge both regions. The three factors for Singapore’s popularity among Australian companies include Singapore’s legal system, strategic location and ease of doing business. 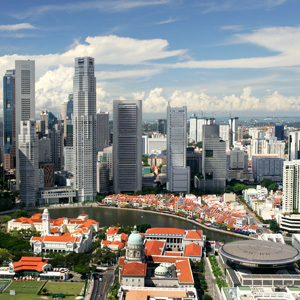 Through Singapore, many companies can expand to other countries in Asia with ease. This is because Singapore has signed over 20 free trade agreements (FTA) with economic partners like US, Japan, China and Korea. It also has over 73 comprehensive Avoidance of Double Taxation Agreements with EOI protocols, which promote transparency and exchange of information. Singapore preserves good international air connectivity with other countries when it comes to trade and industry. Air connectivity is frequent with daily inbound and outbound flights, making business operations more convenient. To learn more, please visit our Start a Singapore Company page.